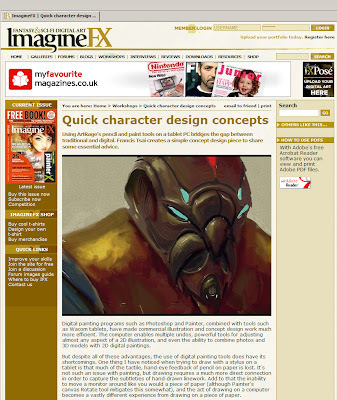 I recently found out that a tutorial I wrote for ImagineFX magazine is available on their site in pdf format. It is a simple character concept design using Art Rage as a sketching/rendering tool. You can see the article here. If you find the article useful or informative, send them an email and let them know you want to see more! If you thought it sucked, tell me why you think so. Linda and I were gone for a week in Tulum, where we were attending a week long yoga workshop organized by our yoga teacher Dana Rae Paré. 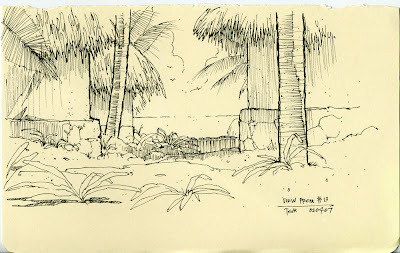 It was a great experience, three yoga classes each day, excellent food, beautiful beach, and the leisurely pace allowed me some time to just sit on the beach and draw. So great to do that, and something I haven't had time to do in years. 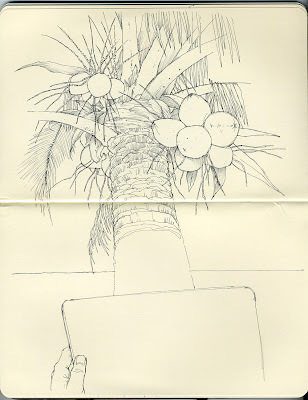 I actually drew this one palm tree several times, concentrating on different aspects each time. I gave away a couple of the sketches, but these are pretty representative.